Keep your gift unique, just like us! Gift Vouchers for ANY occasion. Whether it’s a relaxing lunch-time or sunset cruise, or even a private charter, the recipient/s of your thoughtful gift will not be disappointed. As a BYO facility, guests are most welcome to bring on board snacks and/or favourite beverages to enjoy while cruising. But for those who prefer, tea/coffee and biscuits are provided with our compliments. Would you like to compliment your gift further? Add the option for catering and at the time of booking, your recipient/s can choose between:- fresh sandwiches & fruit salad, delicious fish & chips / calamari & chips, or a tasty cheese platter... pardon the pun! Contact us anytime to organise your great idea! 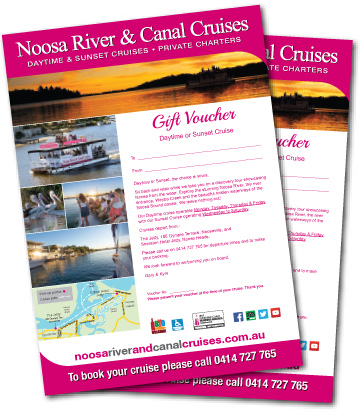 Gift Vouchers can be emailed or sent by post – the choice is yours.